For ice creams, fun with a bucket-and-spade and photo opportunities you could try one of the sandy beaches around the historic town of Berwick-upon-Tweed on the north Northumberland coast. Little Beach is just north of the pier. Views of the red-and-white striped lighthouse at the pier end make it a popular beach with photographers. And there are great views looking back at the coast from the lighthouse too. Berwick-upon-Tweed is also the starting place for the Northumberland Coastal Path which ends in Cresswell Bay some 62-miles away to the south. Sandwiched between Berwick and Lindisfarne and within the Northumbrian Coast Area of Outstanding Natural Beauty, Cocklawburn Beach is a great spot for fossil hunting. At low tide, layers of sedimentary rock are exposed and it is here among the rock pools that you are most likely to find age-old fossils in the limestone layers. You won’t want to sunbathe on Lindisfarne National Nature Reserve’s mudflats but if you’re a wildlife-lover you might want to spend time watching the creatures that do. The tidal mudflats, sandbanks and salt marsh lagoons make a unique habitat for wildlife especially birds and attracts thousands of bird-watching tourists every year too. Lindisfarne (also known as Holy Island) is also home to some sandy beaches though – four of them in fact. All are located on the north side of the island and most are usually fairly windswept spots but Coves Haven Beach is sheltered by high dunes behind, with cliffs at either end which make it a bit of a hidden gem. Bamburgh has vast golden sands overlooked by an iconic castle with views out to the Farne Islands. It is a bit of an all-rounder as apart from the looming 18th-century castle, its flat sands make it a great place for building sandcastles, playing beach games, dog walks and even horse-riding. It’s hidden off-shore reefs and wind-battered coast also make it a favourite with surfers and kite surfers while the rocks of Bamburgh lighthouse offer the opportunity to go rock-pooling. There is a small sandy beach within the harbour walls of the small fishing village of Craster, and shingle and rock ones either side. The harbour used to be an important port for herring fishing and remains well known for its kippers though now there is just one smokehouse left. Pick up some locally-smoked produce here or head out on a walk north towards the romantic ruins of Dunstanburgh Castle. The beach at Alnmouth is cut in two by the River Aln that reaches the sea here. The sandy north bay is popular with families and is a good place for sandcastle building and beach games while the bay south of the river is a little wilder and great for wildlife. Alnmouth itself is a pretty little village that’s worth a wander while you’re in the area too. Warkworth beach is great for golfers and walkers. It’s a 15-minute walk from the ancient village of Warkworth on the banks of the River Coquet, to reach the dune-backed sands of Warkworth beach. The golf course here offers sea views that are hard to beat. The beach is unspoilt and rarely busy. It is a great place for walking the dog and admiring the views out to the RSPB nature reserve at Coquet Island. 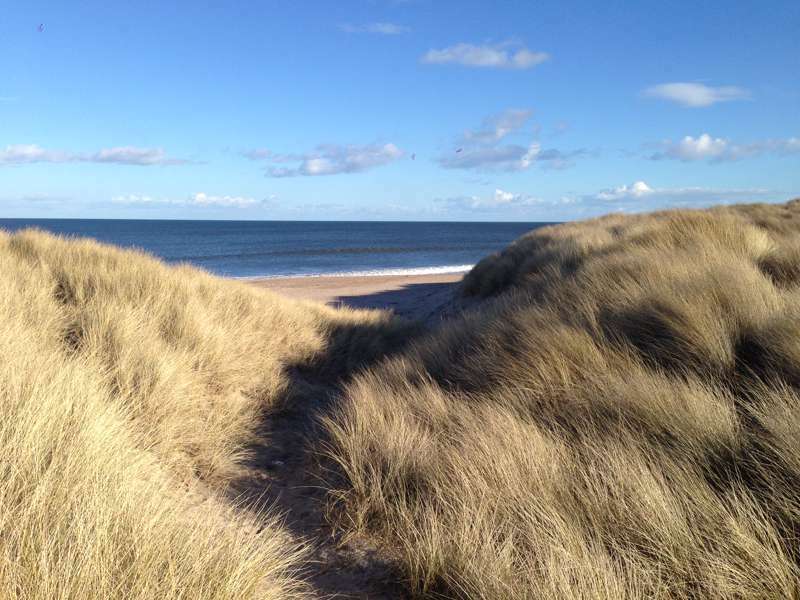 There are seven miles of sand dunes and beaches on Druridge Bay, backed by a series of nature reserves. The beach here is great for long walks or runs. The Druridge Bay Country Park is a good place to access the beach from and accounts for a three-mile stretch of shore as well as some woodland and meadow areas surrounding the 100-acre Ladyburn Lake. There is a visitor centre with toilets, a café, shop and children’s play area. More sand dunes back this beautiful bay in south Northumberland which is a great place for walking and rock-pooling. At low tide, the sandy beach is vast and rocks are revealed at the shoreline. It’s here that you might like to try your luck looking for crabs, starfish and marine plants in the rockpools. Cresswell Bay is also the starting point for the 62-mile Northumberland Coastal Path, a long-distance footpath, that ends at Berwick-upon-Tweed. Newbiggin-by-the-Sea is a classic seaside resort with golden sands, some of which was shipped in from another well-known seaside resort down in Lincolnshire! In 2007 the badly eroded beach was restored with 50,000 tonnes of sand brought up the coast from Skegness. A new breakwater was added to protect it with a much-photographed sculpture of a couple looking out to sea standing on its top.